1. Coherence will be very useful in situations where there is need for sharing/managing huge amounts of data across JVMs. This could be very useful in situations wherein we have a clustered environment and would result in huge performance boosts by having distributed caching. 2. One can have local caching enabled for single node machines. This could help for standalone as well as server applications. But generally, considered a overkill for a smaller application. 3. Coherence does not configure itself automatically for custom applications. One would have to include it while building the underlying code to leverage the functionality. 4. Installing Coherence on an application server does not do anything. It just makes the Application Server Coherence Aware. One would have to build applications from scratch to get the value of coherence. 5. One can have Coherence to cache Static JSPs or htmls. But again this is not done out of the box. One would have to enable custom codesets to achieve this. Well, now everything looks clear. Since, Coherence did not cache any of my JSPs, i wanted to find out why my local OC4J was reacting very fast. Looks like, during installation my OC4J was installed by a newer OC4J. Now lets look at a step by step approach to install coherence in Oracle AS 10.1.3. 1. Download Oracle Coherence and extract the zip file. 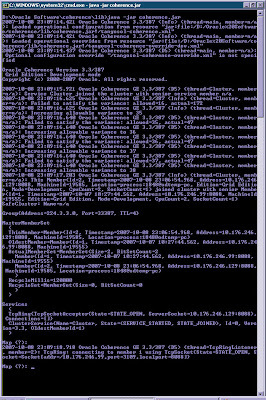 Once this is done, go the lib folder under the extract from command line. Enter the following. 2. Start another instance by entering the above command in a new command prompt. Now we should be having 2 instances running. You should be seeing the who? prompt in both the consoles. This would create a file called webInstaller.jar under a folder called web-install. Copy this webInstaller.jar to one folder up (lib folder). 4. Open a command prompt and navigate to the lib folder. Enter the following command. You must be knowing that Oracle recently acquired a company called Tangosol. The flagship product from Tangosol is now called Oracle Coherence. I was basically going through a webinar on this product(available on OTN) and it got me thinking about the various possible usages of this tool/solution. Considering the fact that most of Oracle’s products run on Fusion Middleware, i can see a good future for this wonderful product/solution. It has multiple capabilities of acting like a web cache, data grid etc and the most important fact is it is very lightweight. Let me quote what OTN has to say about Coherence. In fact, i have installed Coherence on my BI EE OC4J (which incidentally also has Mapviewer) and to be honest i have found some noticeable difference in the performance of some static jsps. I am not sure whether it is because of Coherence since i have not gone much into the details of the product yet. But it looks promising. Look out for an article this coming week on how to go about installing Coherence on Oracle AS.